As a slight side note ~ firstly, i’m super excited to hear this idea in production ~ i’ve been doodling and ranting with friends about the possibilities with solar power and bird feeders for some time now ~ my idea was more 24-hour-diner of feeders (less house like) ~ where in the day birds could get their usual munchies taken care of, and at night the light would attract bugs… but then most discussions got shot down by some of our resident biologists saying how it may turn into more of a bat feeder at night since they’d be the nocturnal residents most interested in the bugs… but that could also be pretty interesting! 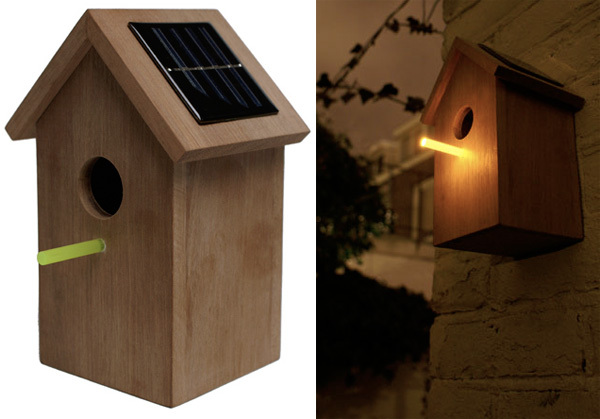 I also played with the ideas of bird feeders by day, lanterns at night… it would be so fun to have a playful project seeing what fun, functional, unexpected uses for solar energy in small scale products we could come up with! I like it becasue it is a solar product. It looks as a bird feeeder in day time and as a solar light in nighr time. So Q! i’ve seen this floating around the internet for the past couple of days, and i would have to say that it is not a successful product - that is, if the goal was to benefit both humans (aesthetically) and birds (habitually). a bird’s biological behavior (eating, sleeping, mating, migration, etc.) is adversely affected by light pollution. birds nest in specific areas for specific reasons, which includes environment (weather) and safety (predators). i can’t imagine they would opt for this as a prime nesting spot after realizing there is a glow stick stuck outside the entrance! Luckily it’s not a bird Jail, so if the light disturbs, they can promptly move out. Considering the birds real estate market is still in tact they can find a new place in a jiff.. probably with out an agent too! I can’t help but feel that the light might disturb the sleep of the birds in the box. I haven’t seen anything like this in nature. Maybe this is just a gadget to please us, not the birds.